U.S. Hyundai Genesis sales have been steady for 5 years, but they did slip in 2013 and 2014 during a growing market. Seeking more customers for its upscale Genesis, Hyundai is relying on a tried-and-true interest of affluent shoppers: golf. 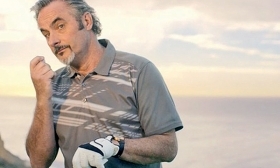 Hyundai has hired golf personality David Feherty, a star of the Golf Channel on cable TV. He will be Hyundai's golf ambassador, appearing in TV ads, making public appearances and working with social media. The deal is part of a broader effort to improve premium-model sales under the Hyundai brand umbrella. That's a challenge because Hyundai is primarily known as a mass-market brand. "When you look at our lineup, we've got cars that stretch from millennials to premium" buyers, said David Matathia, Hyundai director of marketing. Dealer Scott Fink said: "I think spots like this might open people's eyes to what Hyundai has to offer." Fink has two Hyundai dealerships: Hyundai of New Port Richey and Hyundai of West Chapel, both in Florida. The dealerships combined sold 9,300 new vehicles in 2014. Fink said he's pleased with his Genesis sales, but they are a modest slice of his overall sales. Each store sells about 10 Genesis cars a month, for a combined total of about 240 vehicles. Hyundai is targeting a "post-recession buyer that is moving up in the world and places less meaning on status and more on the actual product experience," a spokesman said. The ideal Genesis consumer is 38 to 55 years old and a married midlevel to senior manager with teenage children. The consumer is confident, expressive and savvy, seeking what is next, he said. The base 2015 Genesis starts at $38,950 with a 3.8-liter V-6. The up-level Genesis 5.0, with a 5.0-liter V-8, starts at $52,540. Hyundai's other car with a luxury price is the flagship Equus, which starts at $62,450. All prices include shipping.